Greek art and architecture is divided into three periods: the Archaic Period of 600-500 BCE; the Classical Period of 500-323 BCE; and the Hellenistic Period of 323-27 BCE. The Ancient Greeks created a system of architecture called orders based on proportions that relate each component to the entire building. The Doric order is the oldest and is austere and formal in style. The capitals are simple, with a rounded section at the bottom called the echinus and a square at the top called the abacus. The Parthenon in Athens is typical of the Doric order. The Ionic order is named after the Ionian islands where the order was first used in the 6th century BCE, during the Hellenistic period. 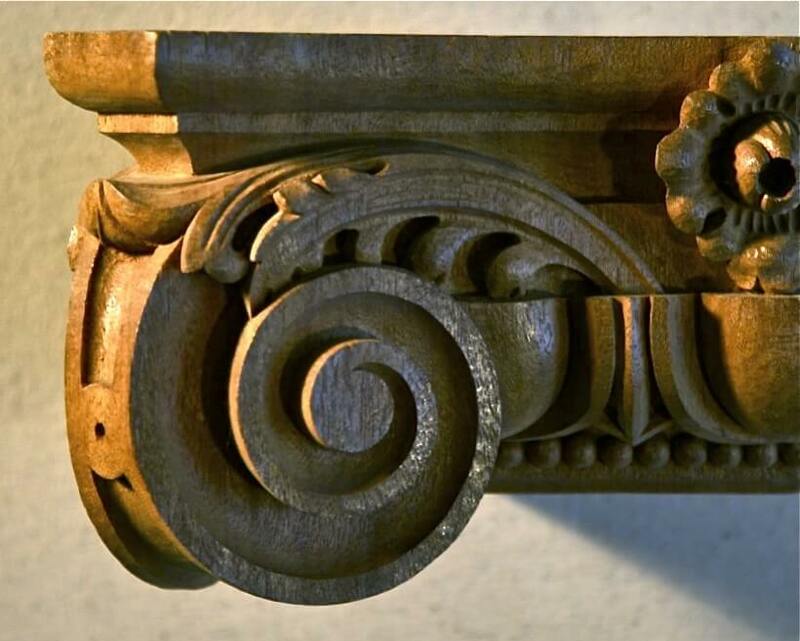 The capitals have scrolls, called volutes, that symbolize either shells or a ram’s horns. 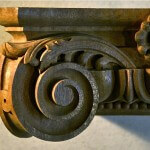 We often see egg-and-dart carved between the volutes. The Temple to Athena Nike at the Acropolis, which was built from about 448-421 BCE, is a good example of Ionic style. The Corinthian order was named after the city of Corinth and is thought to have been invented by the sculptor, Callimachus, in the 5th century BCE. The base, column and entablature are similar to those of the Ionic order; however, the capital has three layers of acanthus leaves. You’ll find Corinthian capitals and columns in the Temple of Apollo Epicurius at Bassae, which was built in the 5th century. 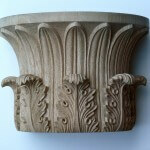 All these carved capitals and columns featured decorative entablatures with moldings and friezes. Every element was sized to work within the overall proportion based on the diameter and height of the respective columns. 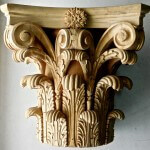 A Greek Temple of the Winds-style capital hand-carved in wood by Agrell Architectural Carving. 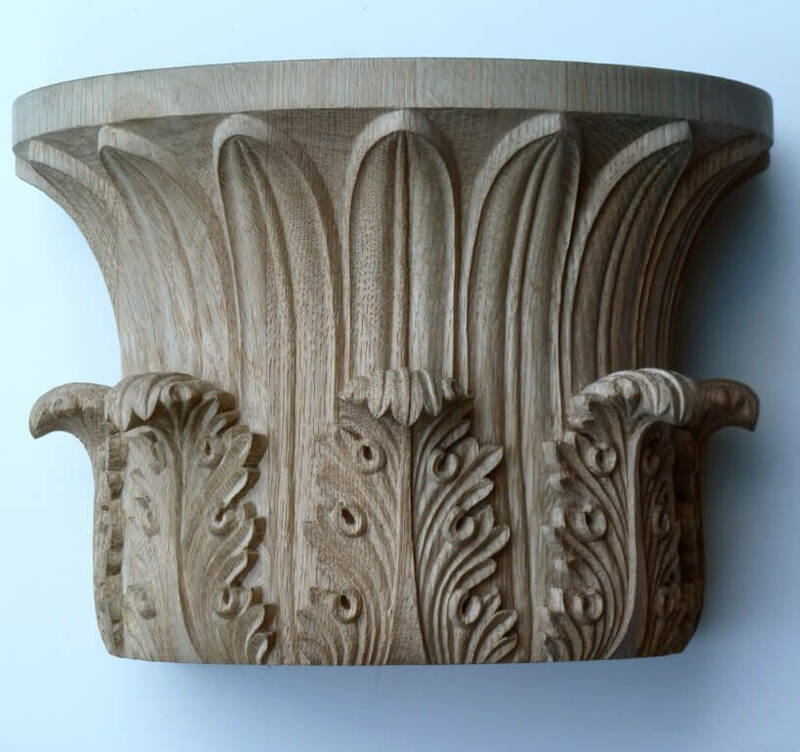 An Ionic-style capital hand-carved in wood by Agrell Architectural Carving.